An adult Brant feeds on the land at Jones Beach State Park in Long Island, October 30th. It has been a while since I've seen Brant (Branta bernicla), but now I know why. They are all hanging out on Long Island! Every little cove, bay, inlet, and pond I stopped at on my recent trip had at least a few Brant and usually a large flock. 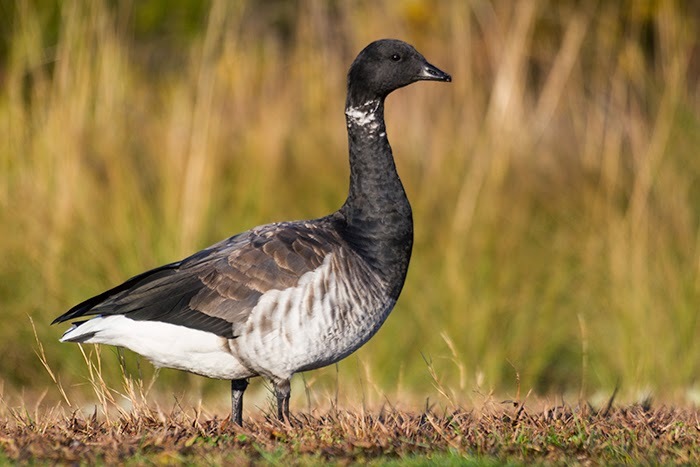 If you've never run into them before, Brant are a small goose species. They never seem to get the attention and press that Canada Geese and Snow Geese get. Perhaps it is because they tend to hang out on the ocean more than inland, or because their voice is more grunt-like than trumpet-like, unlike those other geese species. Nevertheless, they are striking birds. 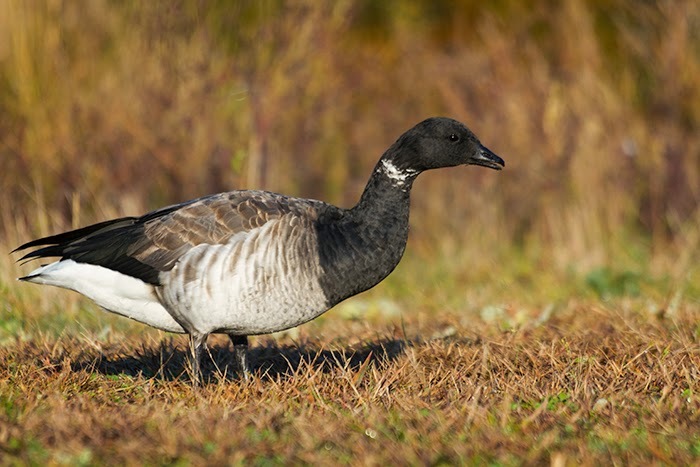 Atlantic Coast birds are similar in coloration to Canada Geese, but instead of white on the face, they have an incomplete and broken collar of white on the neck. As I mentioned previously, they tend to hang out on the water, feeding on eel grass and sea lettuce. However, information I've read said that recently they have been starting to feed more inland on grasses and farm grains. It is believed this is probably a learned behavior from other geese and may be due to food pressure from an expanding population (and undoubtedly aided by shrinking food resources due to human impacts). In fact, the goose pictured here was feeding with another adult and a juvenile on the grasses near the Coast Guard station while the rest of the flock remained off shore. In this image of an adult Brant in Jones Beach State Park, Long Island, you can see the serrations inside the beak.